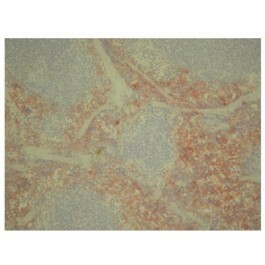 Search for all "Macrophage F4/80 antigen"
Rat anti Mouse Macrophage F4/80 antigen Cl:A3-1. Product is tested for Immunoelectron Microscopy, Frozen Sections, Immunoprecipitation, Radioimmunoassay, Western blot / Immunoblot, Flow Cytometry, Paraffin Sections. Thioglycollate stimulated peritoneal macrophages from C57/BL mice. Immunohistochemistry on Frozen and Paraffin Embedded and Resin Sections. This product requires pre-treatment of paraffin sections (Proteinase K is recommended for tissues fixed for less than 24 hours. Citrate buffer pH 6.0 is recommended for tissues fixed for more than 24 hours). 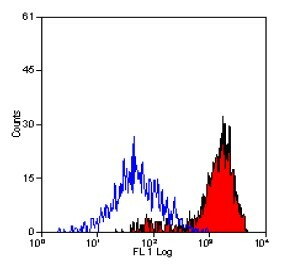 F4/80 antigen is a 160 kD glycoprotein expressed by most murine macrophages. Expression of F4/80 is heterogeneous and is reported to vary during macrophage maturation and activation. 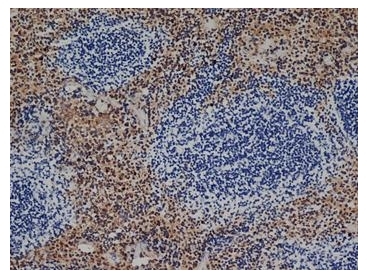 The F4/80 antigen is expressed on a wide range of mature tissue macrophages including Kupffer cells, Langerhans, microglia, macrophages located in the gut lamina propria, peritoneal cavity, lung, thymus, bone marrow stroma and macrophages in the red pulp of the spleen. F4/80 expression has also been reported on a subpopulation of dendritic cells but is absent from macrophages located in T cell areas of the spleen and lymphnode. The ligands and biological functions of the F4/80 antigen have not yet been determined but recent studies suggest a role for F4/80 in the generation of efferent CD8+ve regulatory T cells. Mix to dissolve. Adjust pH to 8.0 using concentrated HCl (10 M HCl). Store at room temperature. Mix well. Store in aliquots at -20°C. Mix well. Discard working solution after use. 1. Dewax paraffin sections and rehydrate using preferred procedure. 2. Cover sections completely with Proteinase K working solution and incubate for 3 minutes at RT. 3. Rinse sections with Phosphate Buffered Saline (PBS). 4. Proceed with serum blocking and preferred staining protocol. Mix to dissolve. Adjust pH to 6.0 with 1 M NaOH (be sure to mix well). Store this solution at RT for 3 months, or at 4°C for longer usage. 1. Dewax paraffin sections and rehydrate using preferred protocol. 2. Pre-heat sodium citrate buffer in a staining vessel to 95-100°C. 3. Immerse slides in the citrate buffer and incubate for 10 minutes at 95-100°C. Check the citrate buffer level, add more if necessary, and then incubate for a further 10 minutes at 95-100°C. 4. Allow sections to cool for 20 minutes. 5. Rinse sections with PBS. 6. Proceed with serum blocking and preferred staining protocol. Kakehashi H, Nishioku T, Tsukuba T, Kadowaki T, Nakamura S, Yamamoto K. Differential regulation of the nature and functions of dendritic cells and macrophages by cathepsin E. J Immunol. 2007 Nov 1;179(9):5728-37. PubMed PMID: 17947645. Kimura H, Miyashita H, Suzuki Y, Kobayashi M, Watanabe K, Sonoda H, et al. Distinctive localization and opposed roles of vasohibin-1 and vasohibin-2 in the regulation of angiogenesis. Blood. 2009 May 7;113(19):4810-8. doi: 10.1182/blood-2008-07-170316. Epub 2009 Feb 9. PubMed PMID: 19204325. Cuzić S, Bosnar M, Kramarić MD, Ferencić Z, Marković D, Glojnarić I, et al. Claudin-3 and Clara cell 10 kDa protein as early signals of cigarette smoke-induced epithelial injury along alveolar ducts. Toxicol Pathol. 2012 Dec;40(8):1169-87. doi: 10.1177/0192623312448937. Epub 2012 Jun 1. PubMed PMID: 22659244. Austyn JM, Gordon S. F4/80, a monoclonal antibody directed specifically against the mouse macrophage. Eur J Immunol. 1981 Oct;11(10):805-15. PubMed PMID: 7308288. Hume DA, Perry VH, Gordon S. The mononuclear phagocyte system of the mouse defined by immunohistochemical localisation of antigen F4/80: macrophages associated with epithelia. Anat Rec. 1984 Nov;210(3):503-12. PubMed PMID: 6524692. Gordon S, Lawson L, Rabinowitz S, Crocker PR, Morris L, Perry VH. Antigen markers of macrophage differentiation in murine tissues. Curr Top Microbiol Immunol. 1992;181:1-37. PubMed PMID: 1424778. Warschkau H, Kiderlen AF. A monoclonal antibody directed against the murine macrophage surface molecule F4/80 modulates natural immune response to Listeria monocytogenes. J Immunol. 1999 Sep 15;163(6):3409-16. PubMed PMID: 10477612. Metwali A, Blum AM, Elliott DE, Setiawan T, Weinstock JV. Cutting edge: hemokinin has substance P-like function and expression in inflammation. J Immunol. 2004 Jun 1;172(11):6528-32. PubMed PMID: 15153465. Moore KJ, Andersson LP, Ingalls RR, Monks BG, Li R, Arnaout MA, et al. Divergent response to LPS and bacteria in CD14-deficient murine macrophages. J Immunol. 2000 Oct 15;165(8):4272-80. PubMed PMID: 11035061. Sumiyoshi, M. et al. (2015) Antitumor and antimetastatic actions of xanthoangelol and 4-hydroxyderricin isolated from Angelica keiskei roots through the inhibited activation and differentiation of M2 macrophages. Phytomedicine. 22 (7-8): 759-67. 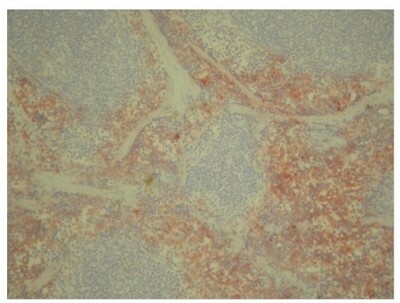 This antibody recognizes the F4/80 antigen, a member of the EGF-TM7 family of proteins which shares 68% overall amino acid identity with Human EMR1. Clone CI:A31 has been reported to modulate cytokine levels released in response to Listeria monocytogenes (Ref.5). We recommend the use of BM4008LE for this purpose.